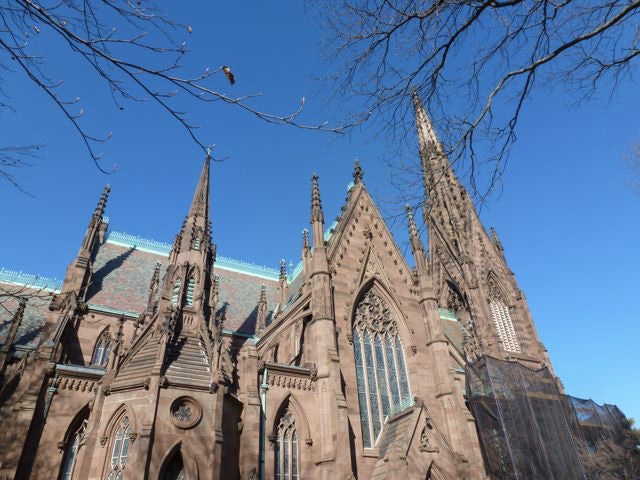 Working with Jeff Harbinson Architects, the Cathedral of the Incarnation project was design-build by ICR and ICC. ICR developed methods and materials for the conservation of the historic spire. Due to previous interventions and corrosion of the reinforcement, sections of the spire were cracking. ICC began work by documenting each of the stone units at the top 50 feet of the spire. The spire was then carefully disassembled and the vast majority were reused. The stones to be reused were cleaned and repaired as necessary in the temporary shop set up at the site. The severely deteriorated stones were replaced with cast stone units. Molds of units requiring replacement were made and cast in the site shop with a mix designed by ICC. The interior of the spire required a new structural support which Old Structures, Inc. designed and ICC implemented. ICC also installed stairs and a stainless-steel grid floor system throughout the spire interior for future access. The spire was then reconstructed using the original stones as well as the cast replacement units. Lastly, the re-gilded cross was installed at the top of the spire along with the fiber optic lighting system.